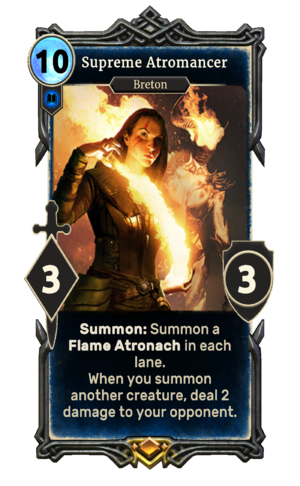 Summon: Summon a Flame Atronach in each lane. Supreme Atromancer is a legendary Intelligence creature card. It is part of the Core Set. This card was previously part of the training mechanic where it could be upgraded from Expert Atromancer at level 40. The card's magicka cost was increased from 9 to 10 in Patch 1.66.1. This page was last modified on 15 February 2019, at 00:06.